Find interesting ways to recycle your bottles. 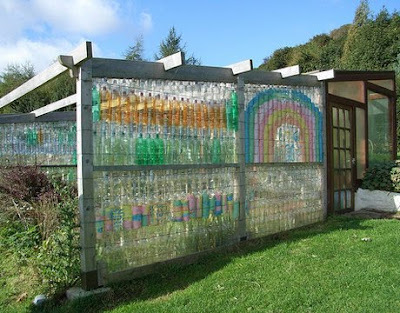 "The Community artist Ilona Bryan says she has "done a lot of strange things with recycling plastic drinks bottles" over the years, although she apparently never thought of building walls. She snapped this photo of a natural sewage treatment area for Scotland's Earthship Fife. "The facility also has a greenhouse made in the same way, as well as various renewable energy and alternative building demonstration project."